The data projectors from CASIO pack a powerful punch and let you enjoy high-end technology, however small the space. The Green Slim series: ultra slim projectors, are flexible and ideal for use on the move and in the office. The slim series protectors deliver a competitive 2500 -3000 lumens of brightness, 2x Zoom and all this is packed inside a unit with a thickness of 43mm and just 2.3kg, this is the world’s slimmest mobile projector in its class. The Standard series: the all-rounder with up to 3,000 ANSI lumens  suitable for mounting and mobile use. The short-focus lens used by the XJ-UT310WNBKT can achieve a 60” size projection from a distance of only 13cm. This enables the projector to be used in a wide range of different environment from classrooms to conference halls. ThePro series: eco-friendly projectors for professional use  ideal for ceiling mounting. The Pro series projectors can achieve an astonishing 4000 lumens of brightness, they also have 1.2x manual zoom, and auto brightness adjustment features. They are well suited for use in a large venue from conference halls to exhibition displays. Its the heart of every CASIO projector: The revolutionary light source. Unlike conventional projector lamps this entirely new technology works without mercury. With a life time of up to 20,000 hours, the hybrid laser & LED light source with up to 4,000 ANSI lumens2 is setting new standards. Experience expressive and realistic colour rendition in high quality  all without conventional mercury lamps. In the advanced illumination technology of the Pro and Short Throw series, the colour blue is generated via a blue LED. CASIO projectors  for up to 10,000 two-hour presentations without lamp replacement. Brilliant colour reproduction, high light output even in daylight and very environmentally friendly performance due to abandonment of mercury – until today, projectors with a combination of all these features have not been available. Through the development of an innovative new lighting technology, CASIO has succeeded in combining all three attributes in a single projector.This marriage of high brightness and environmentally friendly performance is so far unique6 on the projector market. Neither conventional projectors with mercury lamps nor pure LED models are able to achieve this.CASIO is setting new standards for the next generation of projectors. he Intelligent Brightness Control automatically adapts the projector’s brightness to different lighting conditions, thus further optimising energy consumption. The new CASIO projectors fascinate viewers with a brilliant colour rendition and extreme range of colours that is further enhanced by the ‘Helmholtz-Kohlrausch effect’. This optical phenomenon causes an increase in the subjective perception of brightness proportional to the degree of colour saturation. The greyscale rendition of the new projectors is also almost perfect: black appears really black, and not as a very dark grey shade. Images with the vitality and clarity of rich colours and finest details make every business presentation and evening of home entertainment a truly memorable experience. The CASIO projectors cover a larger area of the colour spectrum perceptible to the human eye. Extremely flexible: The new Mobi Show1, 2 app makes it possible to link mobile phones and tablet PCs directly to the projector via WLAN. Presentations and teaching materials can thus be prepared on a computer and then presented from your mobile device whenever desired. The Mobi Show app enables presentations without a computer. CASIO projectors feature WLAN capabilities2 so theres no need for the inconvenience of wiring up to a computer. As many as four computer can be connected simultaneously to the projector via WLAN  perfect for presentations with several speakers. Mobile use or ceiling installation. 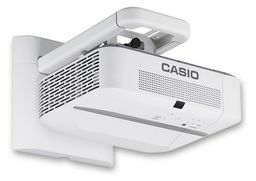 From small offices to large conference halls with ceiling mounting, CASIO projectors can be used in a wide range of different spaces. And with the Quick Start & Stop function, long waits are a thing of the past. The projectors are ready for use in just five seconds. Thanks to the light sources long life time of up to 20,000 hours, the inconvenience of lamp replacement is no longer an issue. Presenting without wiring: with wireless LAN. The projector software Presentation Draw2 (optional) turns lessons and business presentations into an interactive experience: the movement of the Interactive Pointer is registered by the wireless pointing function and reproduced on the projected surface in real time. The interplay of Interactive Pointer, projector and computer enables interactive presentations. Write, scroll and draw: on any projected surface with the Interactive Pointer. The movement of the Interactive Pointer is directly reproduced on the projection. The DLP® 3D Ready feature2,3 opens up new horizons in teaching, presentations and talks. Possibilities such as three-dimensional models, spatial visualisations and engaging, realistic illustrations are within easy reach with CASIO projectors. The optional active-shutter glasses invite you to enter a three-dimensional world. Compelling 3D projections in business presentations and lessons  with DLP® 3D Ready technology2,3. What is the benefit of 3D projections? for presenting three-dimensional buildings, architectural sketches and anatomical models. for lessons with longer-lasting impact and enhanced learning results thanks to fascinating 3D content  such as 3D renditions of molecular structures or virtual perspectives of the Earth. Multifunctional with everything you need. The brightness sensors auto­matically adapt the projector’s brightness to different lighting conditions. 2x optical zoom2 ? optimally adjusts to ambient lighting conditions for complete flexibility. Eco-friendly due to operating without conventional mercury lamps. Brilliant, deep, contrast-rich colours ? even in daylight. Light source with a life time of up to 20,000 hours. Mercury-free hybrid laser & LED light source with up to 4,000 ANSI lumens2. DLP® 3D Ready technology2,3 for three-dimensional projections (active-shutter glasses optional). Projector software Presentation Draw2 for presentations with an interactive pointer (optional). Suitable for permanent usage. Projector restarts once a day. Special warranty for permanent usage. Optimal rendition of images in 16:10 format2 and exceptional picture quality. Easy delivery of presentations from mobile phones and tablet PCs via WLAN (additional software required)2. The WLAN module2 enables wireless operation of the projector from several laptops at once ? eliminating the need to laboriously connect up cables. Energy consumption of 0.4 watt in standby mode (in accordance with EU regulations). 1 Mobi Show is a registered trademark of AWIND Inc.
in Taiwan and/or other countries. 2 This feature is only available with selected models. Please consult the product specifications. 3 3D projection is not possible by using HDMI connector. 4 Only in WXGA resolution. Presentation timer for exactly keeping the planned time. Quick Start & Stop ? ensures your projector is ready to use at the push of a button and makes warm-up and cool-down phases a thing of the past. For presentations on the move without a PC ? with converted files via the USB 2.0 port2. HDMI input ensures that your projector is capable of handling all-digital data transfer.